The nautical theme ships wheel clock is in 3inch in diametre. 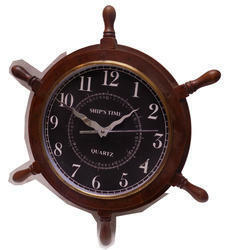 We have marked a remarkable position in the market by offering the best quality array of Wooden Ship Wheel Clock. Super-tanker clocks c.70's/ 80's.Aluminium Base & Chrome Bezel. We specialize in the designing and fabrication of a wide range of Ship Wheel Watch that are finely polished to meet the aesthetic tastes of our clients. The Ship Wheel Watch of these clocks radiate a navigational beauty to the interiors these are placed in. These are available in varied sizes, shades and finishes to meet the varied requirements of our clients. It is available in different size 6, 8, 10, 12 inches. 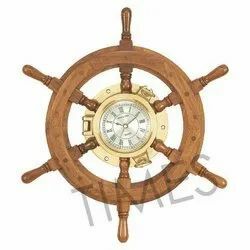 We manufacture, supply and export a wide range of Ships Wheel Brass Nautical Anchor Clock. Antique marine clock made from high quality of solid brass and hardwood.A wood ships wheel clock with brass trimings rests in the wood anchor sculpture of this nautical clock. - 11" Hight and 4" Diamention Clock.